I did it! I managed to grow the herbs from seeds and not buy seedlings - and 4 out of the 5 actually grew! I even used the cilantro and basil for cooking this weekend. This picture was taken in early April when I first planted my little seeds. I definitely learned that you don't need to plant 10-20 seeds. I thought that the more I planted the more likely I was for the plant to actually grow. Not the best theory. My plants are actually overcrowding themselves now because too many of the seeds grew. Lesson learned. 2 months and a couple weeks later and this is what I've got on my porch! Only one of the basil plants actually grew - not sure what the problem was with the 2nd one. My cilantro is growing like crazy, as is the Dill (no idea what to even do with all of it) and the rosemary is coming along slowly but surely. I used the basil to make an Orange and Basil salad, and used the cilantro to make a homemade corn and tomatillo salsa! Love having the outdoor space even if it is kind of small! A big thank you to an old college friend for taking me to West Side Story at the Colonial Theater last weekend. Any time you go to the theater it calls for a nice pre-theater dinner! In Boston's theater district I almost always start out thinking that there aren't that many restaurants in the area ... then a little online research later I'm reminded how close other neighborhoods are. We managed to get a reservation at the new Red Lantern in the Back Bay - probably because we were going early before the show. We got a drink at the bar before being seated - and they had a great drink menu. My friend opted for a more traditional Mai Tai while I went for their Bamboo Juice - Ron Zacapa 23 yr, Don Julio, Passion Fruit, Pineapple. Anything with passion fruit grabs my attention - it was pretty strong for my taste, but good. The atmosphere is fantastic here - amazing decor that makes you feel like you're in a restaurant in LA or NYC, not Boston, though the female servers could maybe wear corsets that actually fit them. It's the Farmer's Market time of year! A few weeks ago all of the farmers' markets in the city started up again - including two right by my work on weekdays, which is so convenient. It's true that sometimes the prices are a bit higher - but you're paying for fresh, local ingredients. I really like being able to talk to the people manning the booths at the farmers markets - hear about their stories, their food. 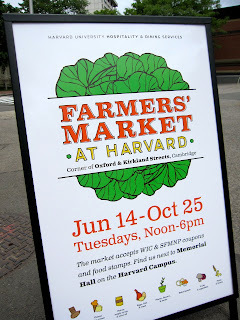 The first of the season for me was the farmers' market at the Charles Hotel courtyard in Cambridge (held on Fridays and Sundays). It's grown since last year apparently - there are local vineyards, fresh fruits and vegetables, local cheese chops and even fresh meat and baked goods. The Still River Winery, from Harvard, MA was there sampling their Apple Ice Wine, which I've never seen before. Similar to regular Ice Wine, it's a thicker, sweet dessert wine that you only drink in small portions. Because it takes so many apples to make small amounts of the drink, it's a bit expensive but nice for a special occasion. On Tuesdays the second farmers' market in the area is held on Harvard's campus. This one is a bit bigger with more variety - their rule is that each type of food item can only be sold by one vendor. For example, there are two fresh pasta companies but they alternate the week that they bring their fresh ravioli. Valicenti Organico was the fresh pasta vendor not allowed to sell their ravioli this week - but they'll have it next week. In place of their ravioli, they offered their fresh pastas - and in so many varieties, including whole wheat options! They sampled their oversized elbows with their homemade tomato sauce and arugula lemon pesto - which were delicious. Their website tells their great story of how they found themselves with this fresh pasta company and has amazing pictures of them making all of their fresh pasta varieties. Especially when it means I can catch up with good friends! In the Boston area I have an endless list of brunch locations to try out so I attempt to try out new places before I go back for seconds at a place I've already been. It's hard to turn down a visit to The Friendly Toast (Cambridge) though. I went back two weekends ago and introduced it to a friend who hadn't been there before - I'm always happy to share my favorite restaurants with others! We discovered their sweet potato fries - and I highly recommend them if you take a trip there. This time around I chose the pumpkin pancakes, which came with raisinettes and homemade whip cream on top. Their pancakes are huge so I only order one. My friend got the "basic breakfast," which comes with 2 eggs any style, homemade toast and home fries, opting for their cinnamon raisin bread. No matter what you like for breakfast you can find something special to treat yourself here. I should also say that the table next to us ordered the waffle with the caramelized pecans and bananas and it looked delicious! Straying away from here, another friend and I finally tried out Masa's Sunday brunch in the South End. Masa is right on Tremont St and after having a nice happy hour there a couple years ago I've been meaning to get there for their brunch. I should note that on Saturday's they have probably the best brunch deal in town - $7.95 for 2 courses and unlimited coffee. They used to have this deal earlier on Sunday but that deal is no more. Even still, the prices are reasonable for city brunch. This is the first brunch in a while that I've been to that they served a nice little breakfast breads basket at the table when we sat down, with three homemade jams and butters. After seeing a lot of people around us order the breakfast burrito I had to choose that - "the ultimate breakfast burrito served with black beans and rice: a soft flour tortilla with scrambled eggs, spring vegetables, monterey cheese, chorizo and southwest home fries." My friend, also interested in the breakfast burrito, ended up settling on the Eggs Benedict - "SantaFe style eggs benedict atop southwestern biscuits, avocado, green chile hollandaise and southwest home fries." She was also smart enough to start out with their Latin Bellini - champagne, mango puree and guava puree. Sounds perfect. I stuck with coffee - and they were happy to bring me milk instead of cream. They also have a selection of breakfast tapas that seemed unique and interesting - granola with tropical fruit, breakfast tacos, caramelized plantain empanadas. It's that time of the year when all of your desserts should start to include fruits and berries - they're fresh, sweet, seasonal and there are endless options for cakes, breads, muffins and more. A cross between a crumble and a cake, a "buckle" is a new type of dessert I discovered last summer. This recipe is reliable and delicious - and can even double as a brunch option. This time around I served it for dessert when I had some friends over for dinner last weekend. To celebrate a coworker's departure we had a nice team dinner out at Teranga in the South End - due in large part to my coworkers new position in an African Studies office. I'm so happy with whoever made the decision to go here because it was a really unique, delicious meal! The owner is from Senegal and the website tells a lovely story of how she grew up in a family of business owners, feeling the need to do so herself. 'Teranga' means hospitality in Wolof, one of the Senegalese languages. The Senegalese cuisine is a mixture of French, Asian, Arabic, and African concepts - and your menu options are vast. The location on Washington St. means street parking, but the meters stop charging at 8:00pm I believe. The restaurant is small - probably less than ten tables, but there is also a bar and overall the place is well decorated and classy. I love any restaurant with exposed brick walls. Given the smaller size, the servers are always available - and so friendly! When I go to a new restaurant like this I like sharing dishes so that I can try more than just one thing. With five of us ladies out we were able to try so many great dishes! For the past few years I've either been to or volunteered at the Jimmy Fund Scooper Bowl, and this year is no different. It opened today and goes through until Thursday evening, so I hope that you too can take the time to check it out down at city hall plaza by government center. It's a fundraiser for the Jimmy Fund - but at the same time it's a fantastic summer event with all you can eat ice cream. This year there are 8 different ice cream companies that are coming in and each one is doing tastings of at least 3 of their ice cream flavors. It's just $8 to get in - a bargain considering you're getting all the ice cream you could dream of and it's all going to charity. Don't worry about the portion size either - you're not just getting a spoonful of ice cream, many of the stands are giving away what is a kiddie or baby size at local ice cream shoppes. 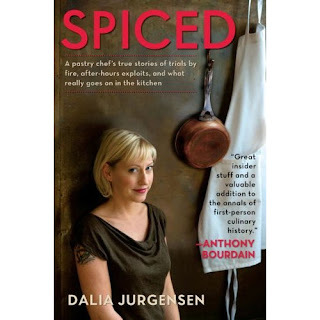 Spiced is Dalia Jurgensen's deliciously entertaining memoir of trading in her office job to pursue her dream of becoming a chef. Martha Stewart test kitchen - great stories! 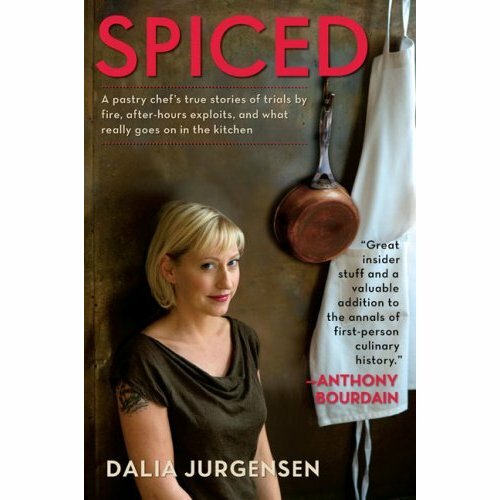 Part of me wishes I could be like Dalia - but after reading her book I'm also pretty sure I'm not thick skinned enough to make it in a kitchen. She highlights the challenges she faces as a female in a male-driven world, and talks about the endless weeks working 70+ hours for little pay. She reminds the reader how hierarchical a restaurant is - giving insight into who sits at the top of the food chain (the chef), and how hard and long she had to work before she was taken seriously as a pastry chef. The other piece I've always thought would be difficult about working in the food business, only confirmed by Dalia's stories, are the late hours on nights and weekends. She talked about how hectic her schedule was, working until the very last customer put their order in, only to go out with the kitchen staff afterwards and start all over again the next morning. Her stories are entertaining and enlightening - and it's a nice, quick read that reminds you just how hard those people are working behind the scenes when you go to a restaurant! Rhubarb is one of those weird plants that takes a whole year to grow. My dad planted some in his garden last year and I finally had some to bake with this year! I also never knew that the rhubarb leaves were this huge! This is easily my favorite time of year for cooking because of the ability to pick fresh vegetables and fruit to cook with right from home. Rather than the usual strawberry-rhubarb pie, I went in search of a more creative use for these rhubarb stalks.